- First thing’s first: grab the Short Laser Musket from the Minuteman corpse in front of the Museum. No point just leaving it there. You can check the corpse for 20 Fusion Cells to power the Musket, as well. - Immediately upon entering the Museum of Freedom you’ll see Raiders on a level above yours, firing at some folks who are out of sight. If you use your V.A.T.S. properly you can probably drop two of the three Raiders before they even notice you. Don’t try to sneak through this area, as you’ll probably just get shot. - There’s a locked door straight ahead that you probably can’t open right now - Advanced lock and all - so take a right from the entrance. You’ll find your way around the gate through some side rooms, and discover a near-ruined set of stairs. Check the ticket kiosks beside the gate for 18 .45 Rounds, 4 .38 Rounds, a Short Pipe Revolver Rifle, and 12 Shotgun Shells. - The floor here is ruined, and if you go down you’ll find a computer terminal beside a small, caged room that appears to contain a generator. You can either hack through the Novice terminal or pick a Novice lock, your call. The generator contains a Fusion Core. To the right and down a short hallway from the generator is a toolbox containing a Psycho (huh? ), some Duct Tape, and a Fuse. Preston from Fallout 4. Don't shoot him, he's useful and junk. - Head up the main stairs. There’s a cooler with some Med-X halfway up, as well as a Switchblade. The stairs split halfway up; start by taking a right. In the first room on your left up here you can find Rad-X in a box, as well as 16 .38 Rounds and some other assorted junk. Head north through these busted-up offices and you’ll find more stuff, including a Caps Stash in the far office contains 14 Bottlecaps. - When you take a left on the stairs you’ll start hearing voices. They’re down a hallway through the first door on your right, and it’s hard to sneak up on ‘em, so be prepared for a bit of a gun battle. Nothing too hard. Once they’re gone, check the room they were in for a duffle bag containing 4 .308 Rounds, a Molotov Cocktail, and a Pipe Bolt-Action Rifle. The two Raiders also have a fair amount of cool stuff on ‘em, and you can now loot the bodies of the dudes you killed when you came in, as well. - Through this room you’ll find a hole in the right wall. This leads to the third floor. You can get the drop on two more Raiders up here if you’re careful. (There’s a large room to pick through, but there ain’t much of interest, so… meh.) On your right is a balcony, and down another right is a room; within sight is a dude named Sturges. Don’t shoot him. Same goes for the other people in this room. 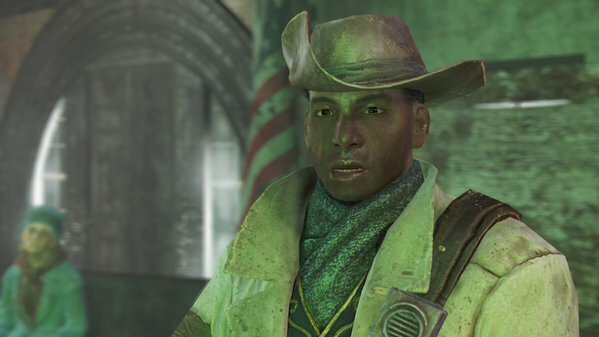 - You’ll have a chat with a dude named Preston Garvey, a Minuteman, and Sturges himself. Chatting with them will give you a new objective - though they require a Fusion Core to make it work. Like, you know, that Fusion Core you found earlier. Hand it over. 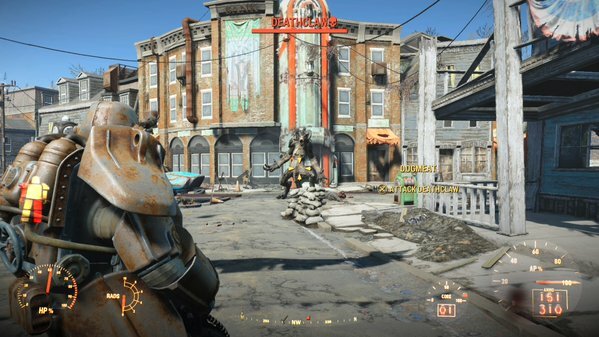 Power Armor faces Deathclaw in Fallout 4. - … though when you do, you’ll bring a slew of baddies down on your head from street level. Either stand in the open and use the Minigun to mow them down (they can’t do much damage when you’re in the Power Armor) or pop out and use something a little more accurate under cover. Not too hard either way, though there are a fair number of the guys down there, so be careful. (And if you have Dogmeat - when did he get a name, exactly? - order him to stay out of the way.) You can safely jump off of the Museum and kill your foes down on the street to improve your aim, as well. - The Raiders will bug you until you head towards the intersection in the middle of Concord, at which point a new threat will pop up. Yay! Try not to kill too many guys before this point, as they can come in handy for the fight to come. Ooo, that’s a biggun. Deathclaw is a fairly simple creature, and will spend the battle just trying to rush at you. Sounds annoying, and it is - but even in your Power Armor you can typically get away from Deathclaw’s grab-and-crush melee attacks just by weaving around the streets and keeping clear of obstacles. Mow it down with your Minigun whenever you have a chance, and use V.A.T.S. to easily target its more vulnerable body parts, particularly its legs. If you don’t kill too many Raiders before this fight you can also distract Deathclaw, as it will go after them just as readily as it pursues you. Yay! Stay on the street in front of the Museum to receive some backup from Preston, as well. - Once Deathclaw is dead you can sift through the dead Raiders to get tooooooons of items, including a shiteload of ammo. Of particular note is their leader, Gristle, whose corpse carries a Corvega Storage Key. You’ll want this for later. (Note, too, the hole Deathclaw emerged from. It leads to Concord Civic Access. - Head back into the Museum of Freedom. The friendlies are here, and Preston will give you 50 Fusion Cells and 100 Bottlecaps. After some more talking - assuming you’re amenable - you’ll also trigger the next major quest, Jewel of the Commonwealth. This will take you to Diamond City, a large settlement. Sounds fun… except you’re not done with When Freedom Calls yet, are you? - Head outside after the conversation. If you want, you can join Preston and the others on their leisurely trip to Sanctuary. 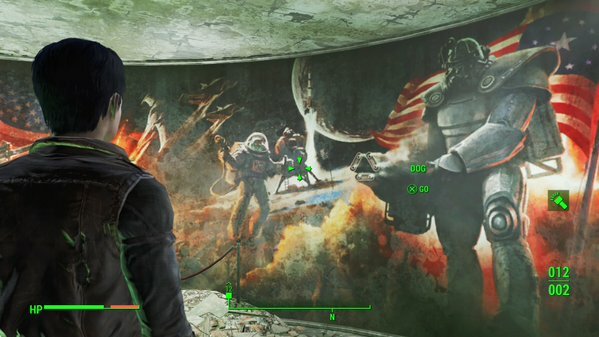 You may also want to repair your Power Armor after the fight, which can be done at the Red Rocket Truck Stop. Regardless, heading back to Sanctuary is wise. Once you’re there you’ll find Preston standing on the street; speak to him and agree to help some other settlers to get the quest The First Step. You can also speak to Sturges (he’s in the house across from your own) to trigger the quest Sanctuary, which will get you started on repairing your old town. - One last thing. Now that you’ve gotten some peeps to Sanctuary, hunt down and speak to Codsworth. He should be lurking in one of the abandoned buildings. (I found him in the little roundabout down the street from your old house; not sure if he moves around.) He’ll now offer up his services as a companion. If you decide to take him over Dogmeat you’ll have an option as to where you can send the pooch; send him wherever you think he’ll be easiest to find. You can jump from the church roof onto the vertibird to get the mini gun early, as well as the power armor, making this even easier.